Indian taxi aggregator apps are leaving no stone unturned to grab media attention in today’s hyper-active times of short attention span. But while some are doing it the right way, benefiting all the people involved in their eco-system, others are trying to make quick bucks and attract instant limelight, which may not prove to be quite fruitful in the longer run. We will start with the good news first. Ola Cabs, which is right now #1 Indian taxi aggregator app, has launched a unique inventive program for their drivers in Bengaluru; as per which they stand to win 2BHK flats, along with abroad trips and EMIs for their cars. Named as ‘Ola Premier League’, this is a 5 week long contest based on the number of trips fulfilled by the drivers. A minimum of 50 ‘runs’ or trips in a week is required to qualify for this contest. Driver who scored most ‘runs’ will win a 2BHK flat in Bengaluru. It is not yet clear whether they will be required to pay for the taxes or not. Next top 50 weekly winners will get vouchers worth Rs 8000 to purchase electronic gadgets such as TV, Fridge, mobile etc. Along with the number of trips scored, the competition will also integrate customer feedback and ratings into this incentive program. Earlier, Ola had launched various schemes and programs to keep up the tempo of their drivers, and to encourage more stellar performance. ‘Ola Stars’ is a program which provides their drivers medical insurance, scholarships for their children and more. ‘Ola Pragati’ is a unique financial program in association with SBI wherein their drivers can get low interest loans; and empower them to pay their EMIs on a daily basis. Heads up for such unique incentive program for drivers, which is certainly a first in India. In Mumbai, black-and-yellow taxi operators announced a massive strike to protest against the onslaught of taxi aggregators such as Uber and Ola which has disrupted the market. However, the irony was that, Uber & other taxi aggregators decided to use this strike as an excuse to charge more. 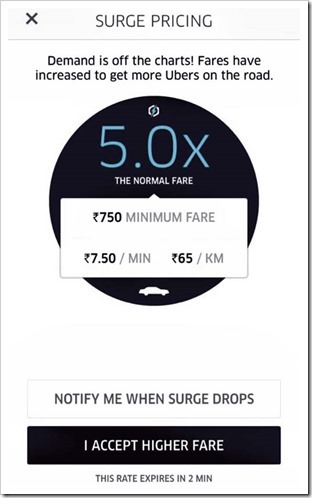 As per reports coming in, Uber decided to hike their base fare upto 5 times, and it touched Rs 750 at some point of time. Usually, its Rs 150 as base fare for the first 5 kms. Not only that, per km charge zoomed upto Rs 65/km, against Rs 13-17 which is the norm. As 40,000 taxis in Mumbai resorted to strike, consumers were left with no other option than to pay such insane tariff rates. 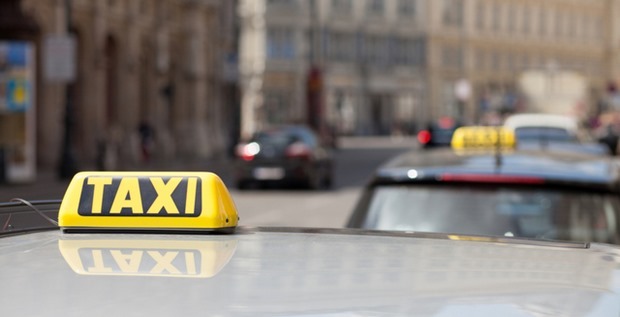 It seems Ola and Taxi For Sure were also indulged in this ‘day light robbery’, a term which was coined by some social media users after the rates suddenly increased. Uber justified it by saying that their algorithm works on the demand and supply rules. Karun Arya, Head of Corporate Communications (India and South Asia), Uber said, “The hike in fares is on the basis of algorithms fed into the system. Considering that the strike was called for opposing the entry of Uber and Ola into the taxi market, they could have, atleast, instructed their algorithm to charge nominal rates. "Taxi App Chronicles: Ola Offers 2BHK Flat As Incentive To Their Drivers; Uber Hikes Tariff 5X in Mumbai", 5 out of 5 based on 1 ratings.